Back in the Olden Days, when I used to work at the Apple Store, I met friend and fellow Apple enthusiast, John Ellenich. Almost two years since I started working at and quit Apple, John and I decided it would be smart to design and release a premium theme together in conjunction with Unique Blog Designs. We are proud to release Citrus Theme in six beautiful colors. 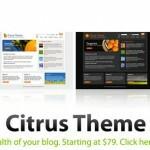 You can learn more about Citrus Theme here… Let us know what you think! It’s looking very cool theme. Well Designed, Nate. I like it, it is really nice!!!! Wow, they look great. And it’s currently Spring here in South Africa, what a coincidence. They’re just perfect for the feel of this season. Good luck with the new theme, buddy. Very appealing and for a better word to use, neat. Congratulations. All the best with the new offerings. that theme is hot! i love it. They look good. Congrats on the job well done. Nice group of designs dude, they look great! I’m sure they will do very well. Sweet design. I like the fact that you made them in 6 different colors as well. Whose the winner of 8 GB Ipod, and 3 winners of Citrus theme? Contest winners were announced here. awesome design. looks really neat! The designs have a very structured look and smooth feel. A great addition for bloggers who want to add necessary information and details right at their readers fingertips. Very nice, I want get them for a new blog I am starting. I can see the Apple influence on the Citrus theme website. Obviously you have been busy living life and networking and not so busy on the blog! Hope you get time soon to post details on the site. Some nice designs there. Have to take a closer look I think. The new theme looks amazing. watching out! !